I put all the dry ingredients in my mini chopper and blended well. Then added everything and mixed just until combined. 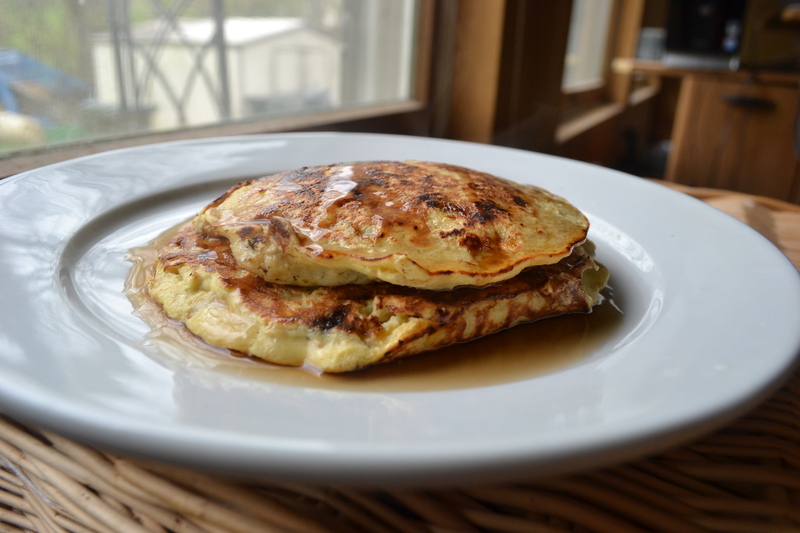 These actually weren’t too bad – kind of like eating oatmeal in pancake form. It didn’t have the fluffy texture I was looking for, but the flavor was good. And these kept me full a long time! So yet another Sandwich King creation. I’ve made his Meatball sandwich with hot peppers. I’ve made his Roast Beast Master sandwich with onion rings. And I’ve made the Sandwich Kings fries. 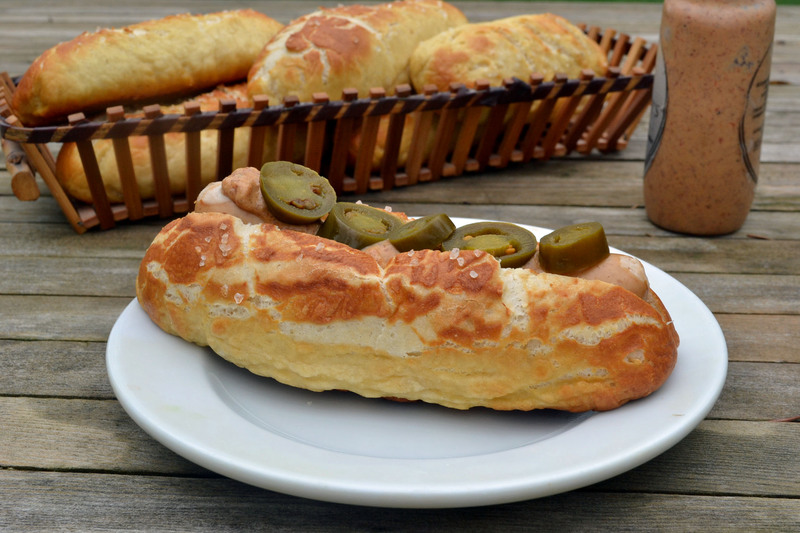 So now I bring you The Sandwich King’s Pretzel Bun Hog Dog. Holy cow – this one is a winner, winner, lobster dinner. The pretzels aren’t too hard to make, you just need time to let the yeast bloom, and it rests for 45 minutes, and you boil them before baking. 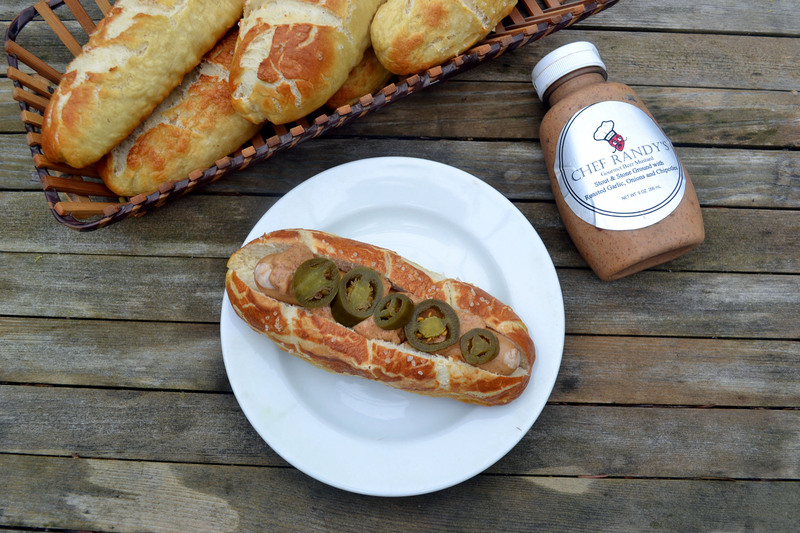 I know it sounds complicated, but trust me, even if you’ve never worked with yeast before, you can make this! Line 2 baking sheets with silicone mats.Turn the dough out onto a lightly floured cutting board and form into a ball. 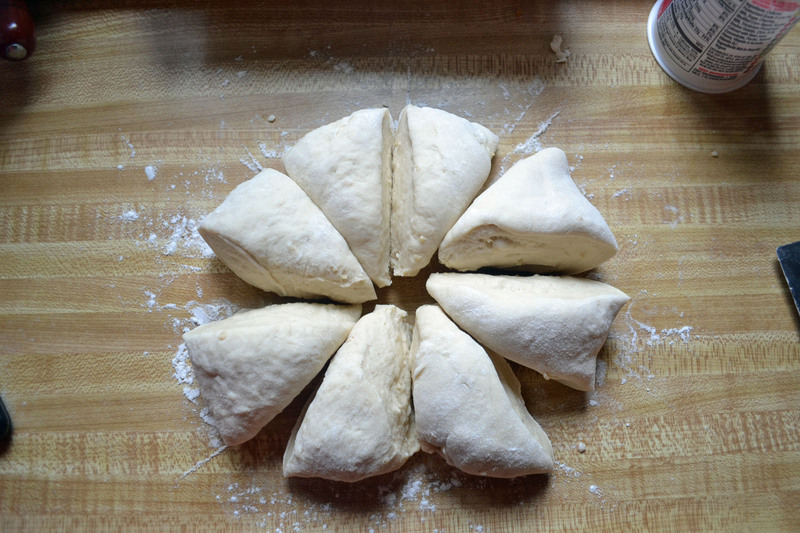 Cut into 4 equal pieces, and then cut those in half to form 8 equal pieces. Using your hands, roll each piece into a ball and place onto a prepared baking sheet. Cover with a dish cloth and let them rest in a warm place for 12 to 15 minutes. You need to make sure that the milk mixture isn’t too hot, otherwise it will kill your yeast. 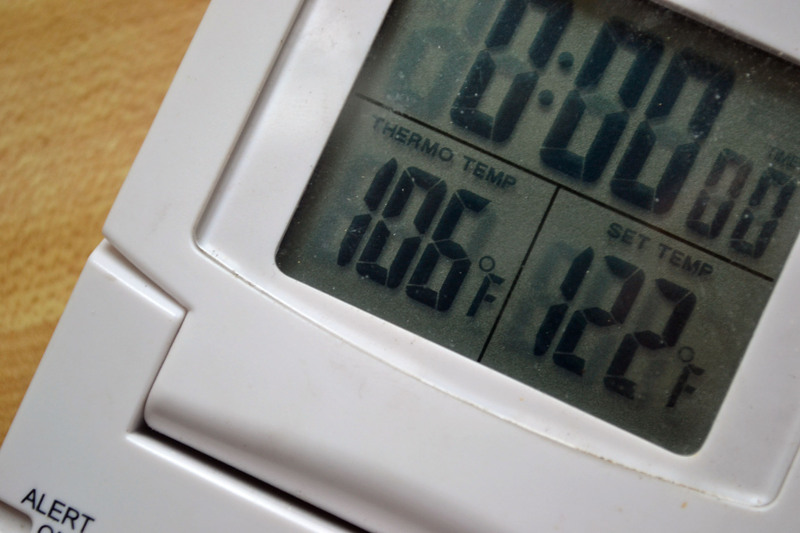 I use my meat thermometer. 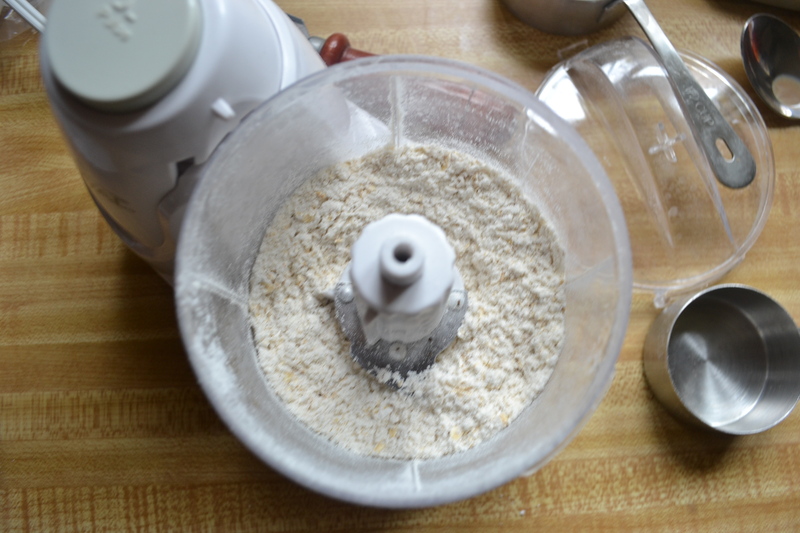 Even if you’ve never worked with yeast before, this is a pretty simple recipe. The end product was soft on the top, but crunchy on the bottom. I didn’t make the cheese sauce, but I had spicy mustard and pickled jalapenos on mine. Um, there was no power foods in my lunch, so it “cost” me 12 points, but I still have 34 points for the rest of the week and I think I’ll be okay. 😀 Totally worth it! The bun comes in at 8 WW points, or 300 calories, 3.8 fat, 56 carbs 1.9 fiber and 8.7 protein. Winning! 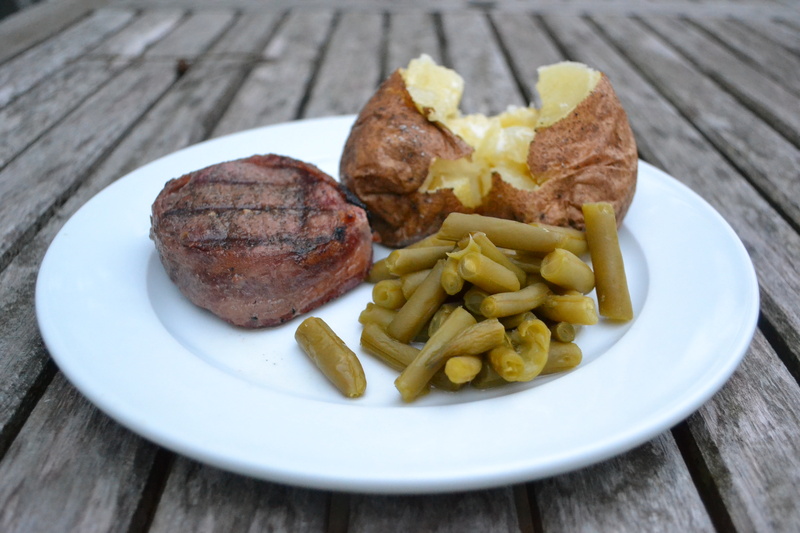 For dinner I made filet mignon – in the sale bin two for $4! I had a baked potato on the side with some green beans, so I only had to count the butter for 2 points. Then after dinner Tony and I watched The Guard on Demand. It was really good! It’s twinfest today! Going to celebrate our birthday with our best friends – its gorgeous today! Don’t forget, last day to enter your breakfast BSI recipe – simply leave a comment or email me at mybizzykitchen@gmail.com. The round up and winner will be announced in tomorrows post.